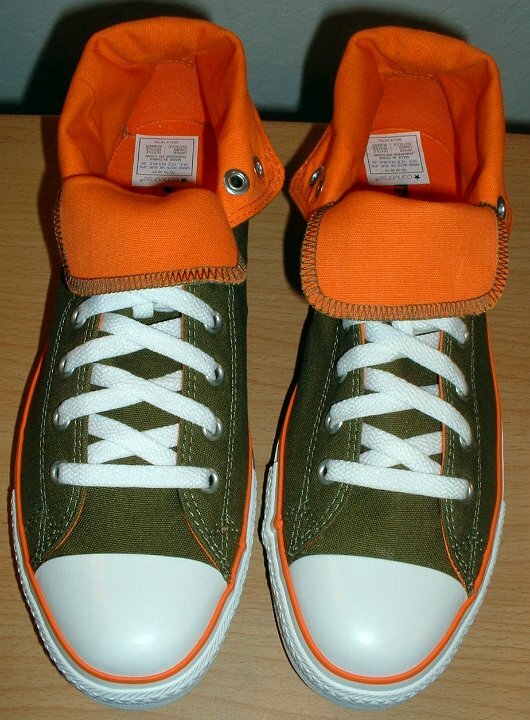 Photo gallery of green and orange foldover high top chucks. 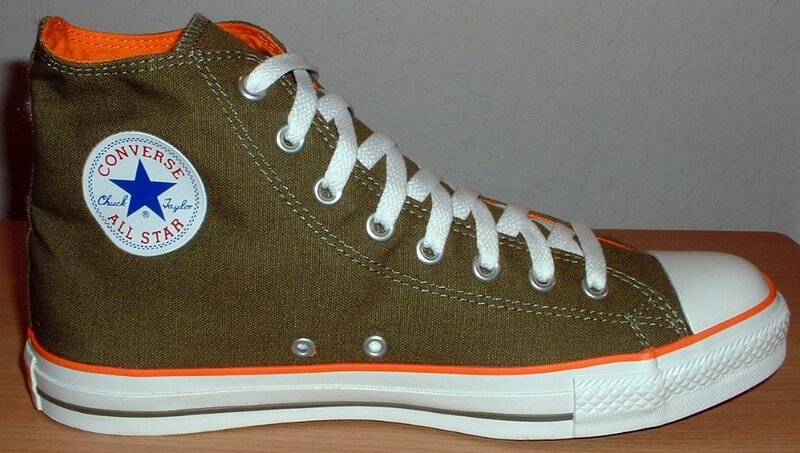 1 Green and Orange Foldover High Top Chucks Outside view of a left olive green and orange foldover. 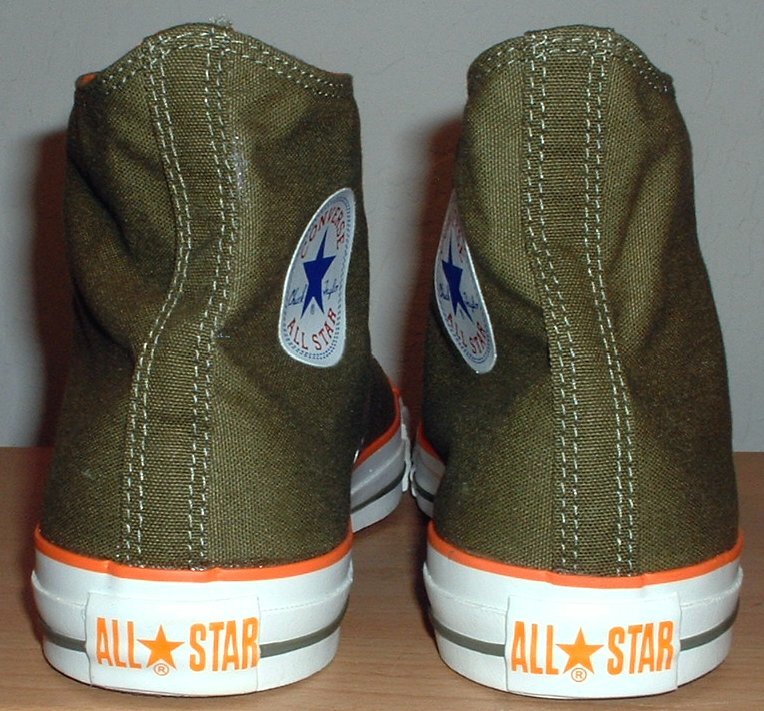 2 Green and Orange Foldover High Top Chucks Inside patch view of a left olive green and orange foldover. 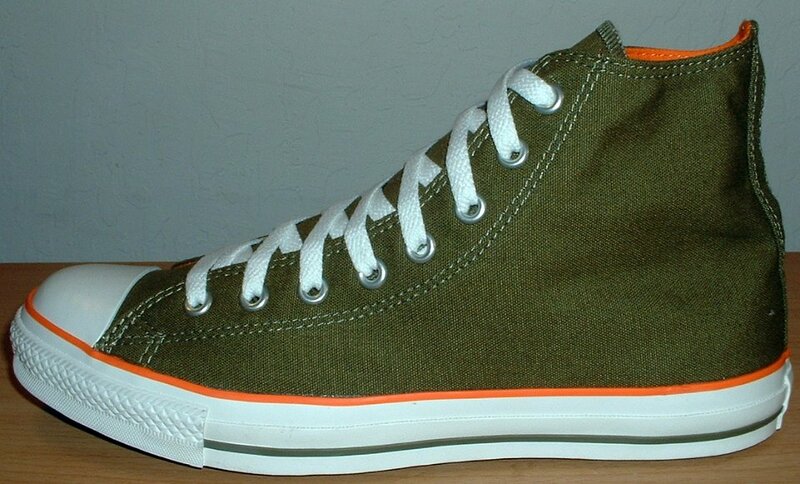 3 Green and Orange Foldover High Top Chucks Inside patch view of a right olive green and orange foldover. 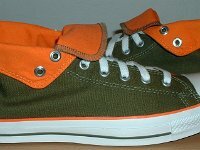 4 Green and Orange Foldover High Top Chucks Outside view of a right olive green and orange foldover. 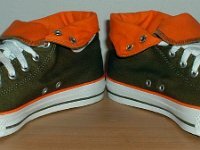 5 Green and Orange Foldover High Top Chucks Front view of olive green and orange foldovers. 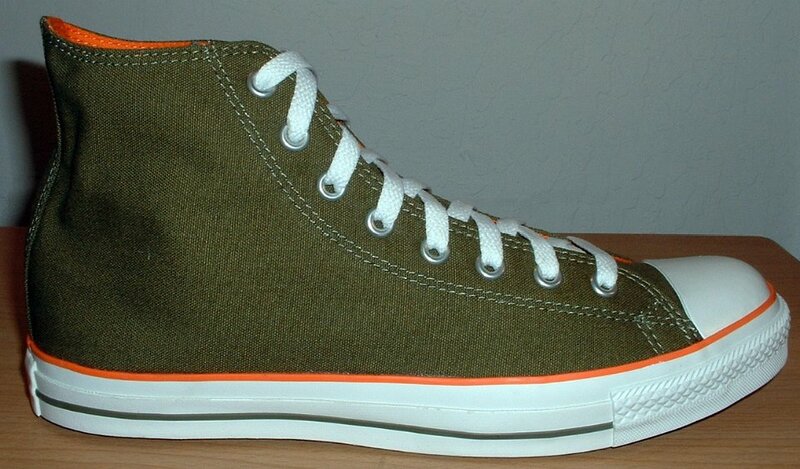 6 Green and Orange Foldover High Top Chucks Angled front view of olive green and orange foldovers. 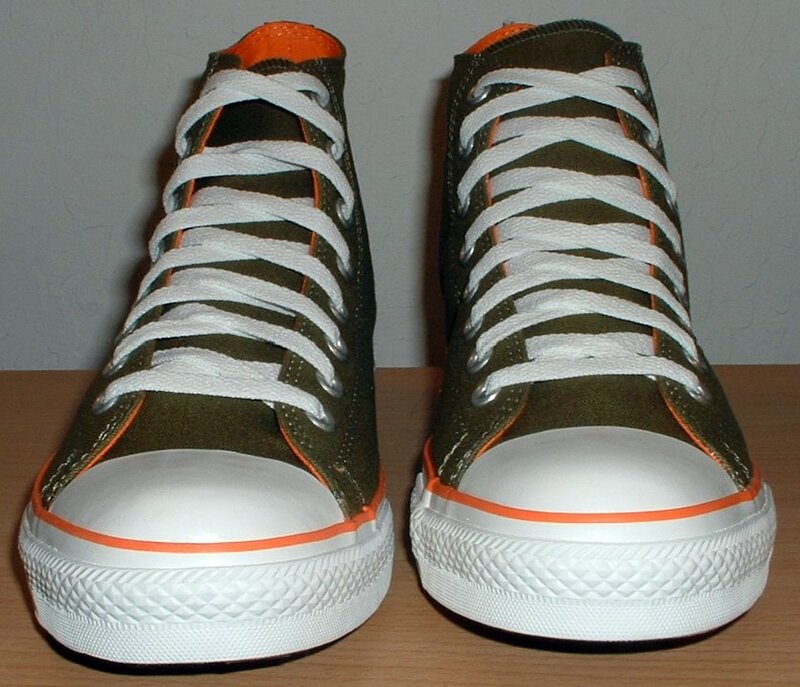 7 Green and Orange Foldover High Top Chucks Rear view of olive green and orange foldovers. 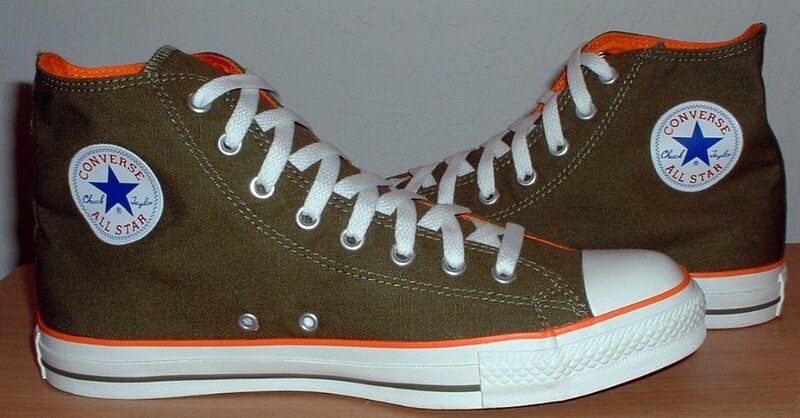 8 Green and Orange Foldover High Top Chucks Top view of olive green and orange foldovers. 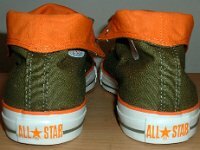 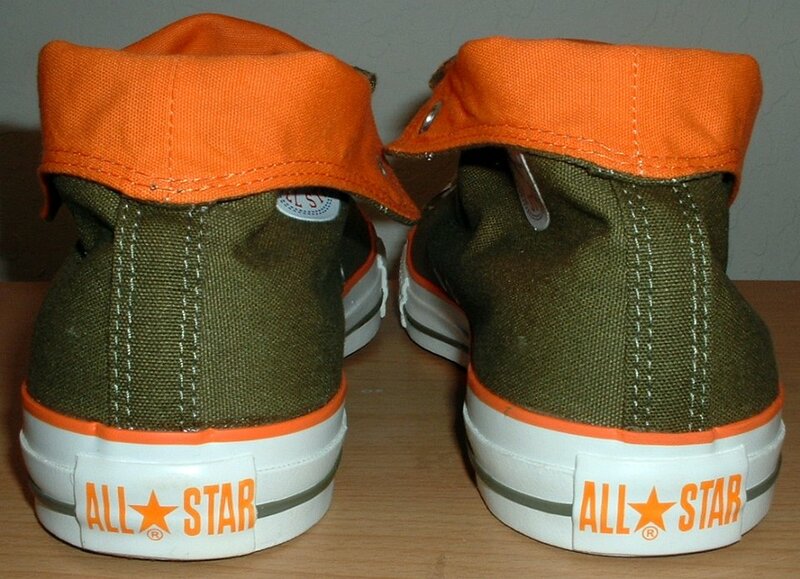 9 Green and Orange Foldover High Top Chucks Inside patch views of olive green and orange foldovers. 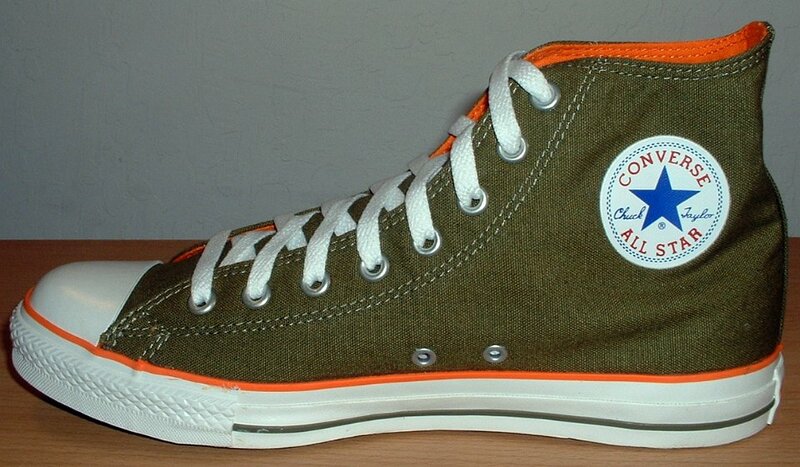 10 Green and Orange Foldover High Top Chucks Outside views of olive green and orange foldovers. 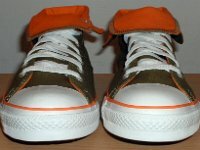 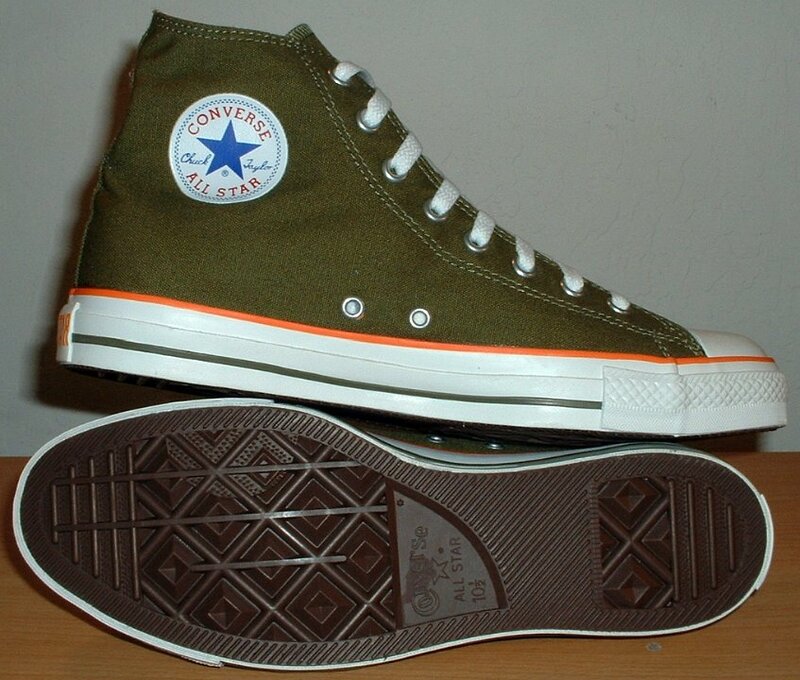 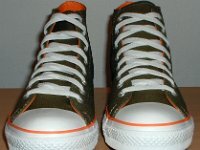 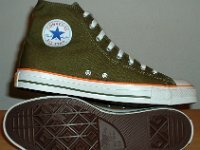 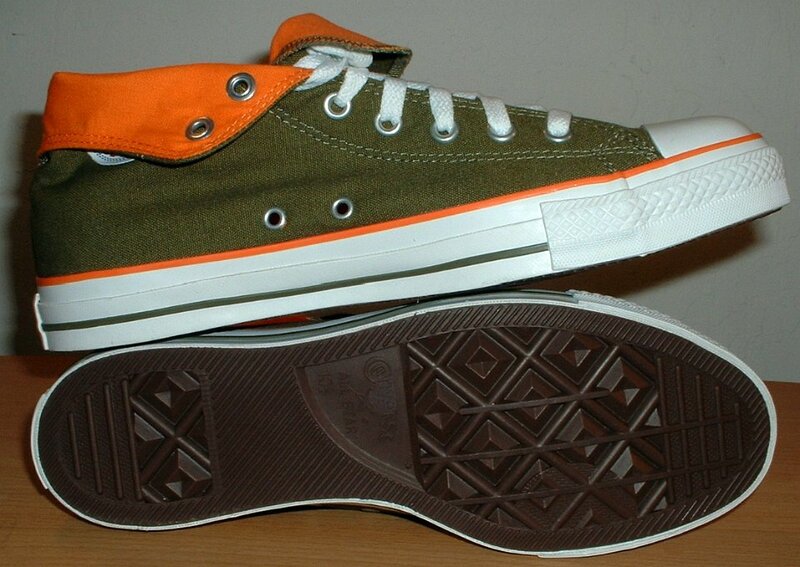 11 Green and Orange Foldover High Top Chucks Sole and inside patch views of olive green and orange foldovers. 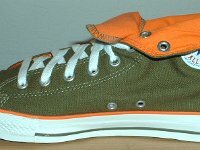 12 Green and Orange Foldover High Top Chucks Outside view of a right olive green and orange foldover rolled down to the sixth eyelet. 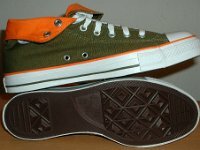 13 Green and Orange Foldover High Top Chucks Inside patch view of a right olive green and orange foldover rolled down to the sixth eyelet. 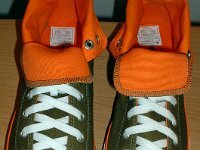 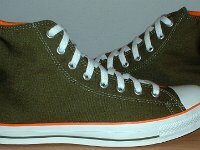 14 Green and Orange Foldover High Top Chucks Outside view of a left olive green and orange foldover rolled down to the sixth eyelet. 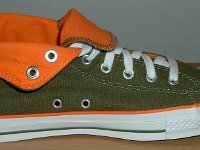 15 Green and Orange Foldover High Top Chucks Inside view of a left olive green and orange foldover rolled down to the sixth eyelet. 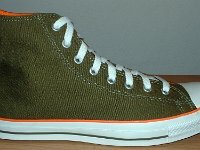 16 Green and Orange Foldover High Top Chucks Front view of olive green and orange foldovers rolled down to the sixth eyelet. 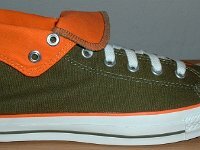 17 Green and Orange Foldover High Top Chucks Angled front view of olive green and orange foldovers rolled down to the sixth eyelet. 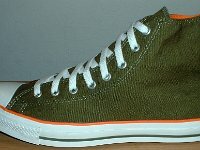 18 Green and Orange Foldover High Top Chucks Rear view of olive green and orange foldovers rolled down to the sixth eyelet. 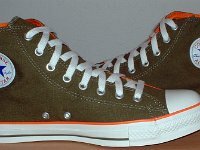 19 Green and Orange Foldover High Top Chucks Top view of olive green and orange foldovers rolled down to the sixth eyelet. 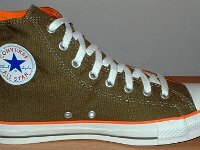 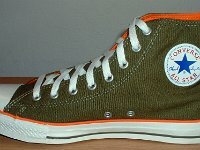 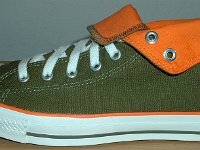 20 Green and Orange Foldover High Top Chucks Outside views of olive green and orange foldovers rolled down to the sixth eyelet. 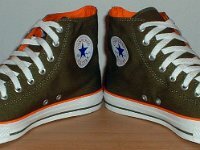 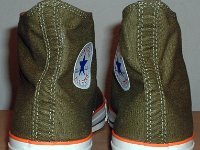 21 Green and Orange Foldover High Top Chucks Inside patch and sole views of olive green and orange foldovers rolled down to the sixth eyelet. 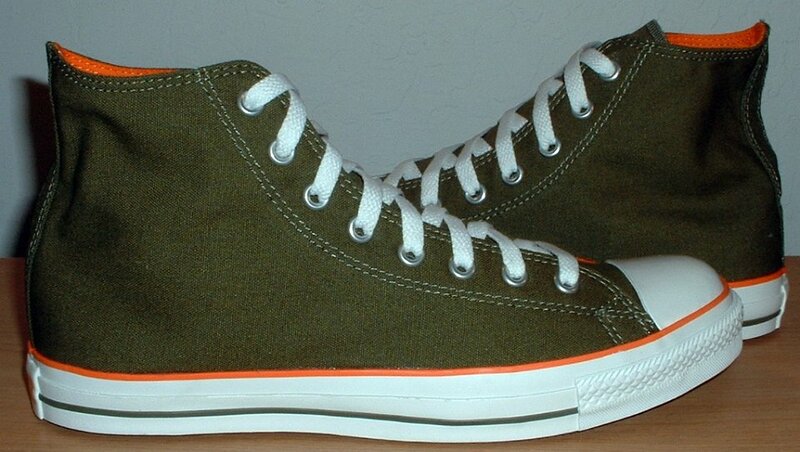 These high tops have olive green canvas outsides and orange inner canvas. 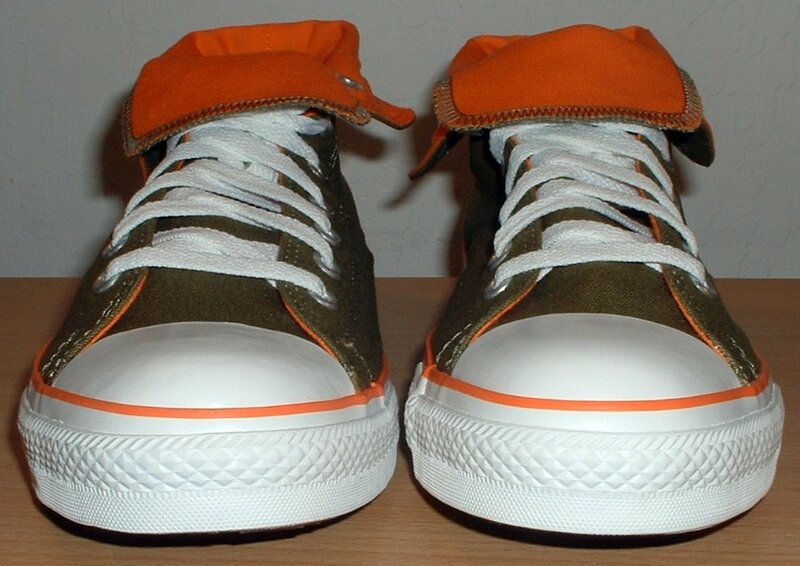 They have orange and olive piping and an orange and white heel patch. 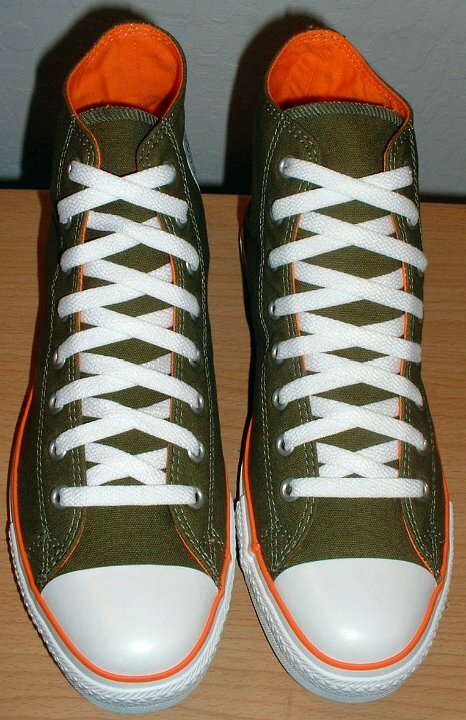 The shoes came with white laces. 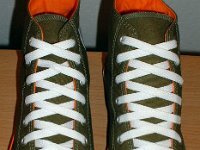 Foldovers can be worn laced to the top or rolled down to the sixth or seventh eyelet.